Congratulations to the winner of our 2018 Xperitas Alumni Scholarship: Lily Hauptman. 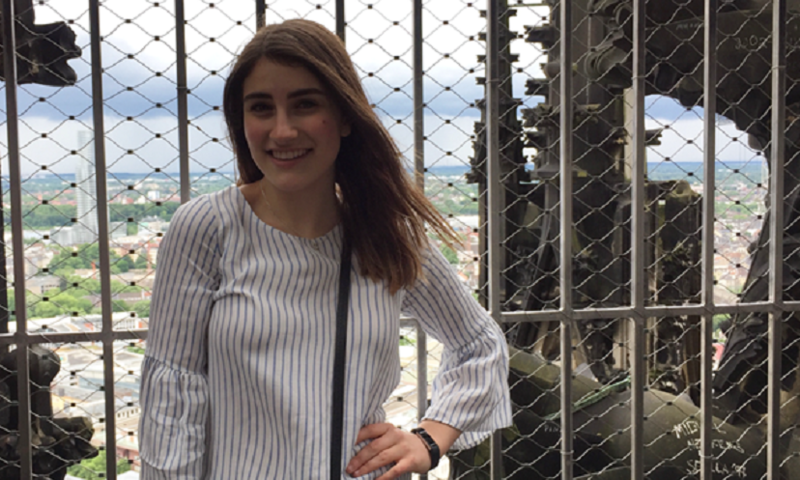 Lily will put the Xperitas Alumni Scholarship to good use in the fall, when she plans to begin coursework (including German!) at Vanderbilt University. We had a chance to speak with her recently about her experience and her future plans! Please get to know this amazing student by reading our interview below. Can you tell us about your preparations for your Xperitas German immersion program? I started learning German in seventh grade, so by the time I left for Germany, I had studied it for five years. I really think that my classroom experience equipped me well. We spoke freely in German in class, so I wasn’t too afraid of speaking. I knew it would be OK if I didn’t speak correctly all the time. My teacher at my school really let us know that it was OK if we messed up, that we should just keep talking. I was really excited to go to Germany, and I think it also helped me in the classroom this year. I expanded my vocabulary, and I got more comfortable with speaking, and I fell in love with the language more. When you think about your experience on the trip, are there other things besides an increased confidence in your German ability that you came away with, or that you take with you as you go to college? I definitely gained a greater sense of independence. I learned how to travel in a foreign country on my own, which made me a lot more comfortable with going to college next year. It equips me well for next year, because all the little things I did on the trip – even carrying my passport by myself – all of those moments gave me freedom and equipped me with skills that I know I’m going to use in the future, when I’m on my own next year. Was your family nervous about you going abroad without them? I think my parents were more excited than nervous. My sister did a trip abroad, so they knew what to expect. They were just excited to see all the things I did and how my trip was different than hers. Do you plan to keep studying German? Yes. Definitely. I’m not sure if I’m going to minor in it or major in it or what my exact path would be, but I want to be taking classes. At least in high school, not many people take German, so it also provides me with a community, and I think that would be nice in college, too. When my mom was looking at schools for my sister and me, she was looking at the teachers. Even though my sister was just going into middle school, she met the high school German teacher and thought she would be a really good teacher. My sister ended up taking German, and she was a great teacher, and then I took German too. I have found that all the German teachers are incredibly supportive, and they want to see you succeed, and they want you to grow as a speaker. Some of my friends in other languages, I don’t think they feel as comfortable speaking as I do. Because of the environment that the teachers have given me, I felt comfortable to speak more freely and really understand and learn German. Did you find that there was anything that you weren’t quite prepared for? In class, I learned a lot of vocabulary that wasn’t everyday vocabulary. I learned a lot of literary analysis and things like that, and so when I got to Germany, I realized there would be a learning curve with even the simplest words. I had learned how to say all of these more complex words, and I could discuss books and things like that, but I ended up coming out of the trip with more conversational skills, which I think I lacked a little bit beforehand, which is one of those things you can only acquire once you go to a country and speak with native speakers. I gained more conversational skills and feel more comfortable engaging in casual conversation now. Anything else you want to share with the Xperitas community? I’m very grateful to have had this experience. I was extremely nervous beforehand, because I only really knew one other girl who was going on the trip with me, but ultimately, I became friends with so many people and Germans. I became really close with my host family, my host sister, and my host family’s friends. I can’t imagine life without all of these incredible people. I definitely think that those three weeks that I had in Germany are full of memories that will last a lifetime. Are you going to try to see your host family again? I really want to see my host family again. They were absolutely the sweetest people. My birthday was during the trip. It was one of the best birthdays I’ve ever had. I woke up, and thy surprised me with a cheesecake for breakfast! They were very, very kind to me and warm. They made me feel comfortable. I am not completely sure. My sister is studying abroad in Germany this semester. Their semester runs March through July, so we might go visit her, in which case I can use my German skills again! In the past, I’ve also done a summer program called Kode with Klossy, which is a coding scholarship camp, and I hope to do that again. German and coding, and I’m set!